Depending on what site you are searching for the rustic theme goes by a variety of names Aspen, Hideaway, or Nature. I really do not care what you call it I am all over it this holiday season. I am completely in love with the rustic-chic Christmas theme decor. This year I am not sure if it's the fact we moved to the Northwest and there is so much nature around us but I cannot get enough. So this year I have pulled out all the stops for my super chic hideaway Christmas decor. I partnered with the amazing luxury home decor brand, Amara. If you do not know Amara as a brand let me introduce you, I am such a huge fan but their Christmas decorations are the BOMB DOT COM! I was so excited to pick out our Christmas tree! We are big fans of the holidays in The Fern household, so it was important that the tree be the focal point of the house. In true Fern fashion, we took the whole family including Midas our golden retriever out for a Christmas tree trimming. That's right I found a wonderful local farm where we could cut down our own tree. 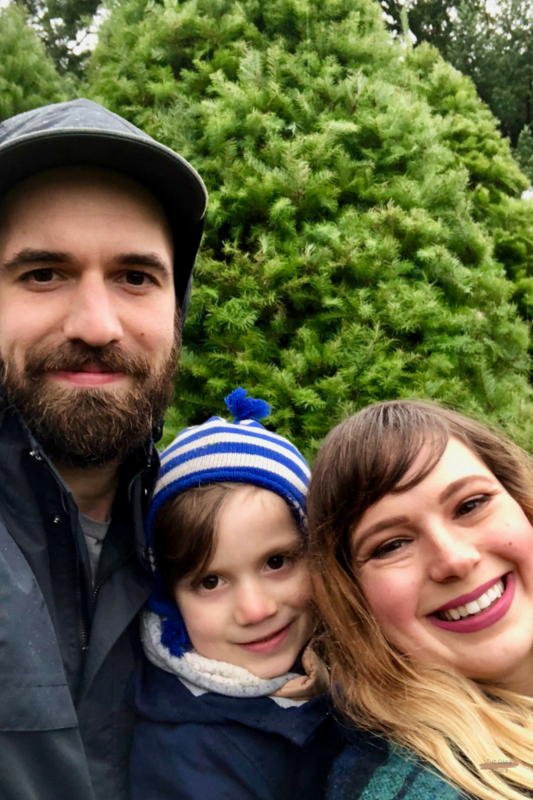 We headed over to Quail Creek Ranch Christmas Trees a gorgeous ranch right here in Portland. There are over 20 arches of Christmas bliss with a warming hut and hot cocoa. For us, it was not just a special memory we will have forever but we were able to support a local business in our community. When you get home, keep your tree in water in a sheltered, unheated area such as a porch or garage. 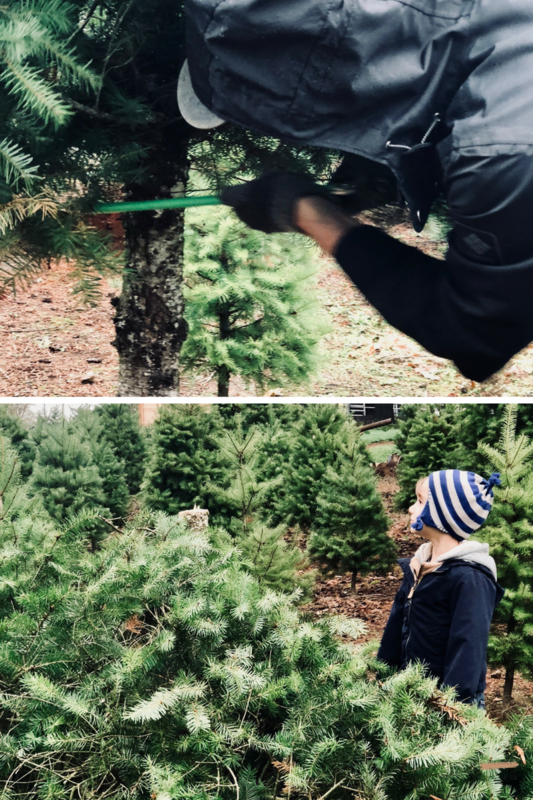 Before you set your tree in the stand, make a fresh, straight cut across the base of the trunk (about a quarter inch up from the original cut); use a tree stand that holds a gallon of water or more. Important: Keep the tree stand filled with water. Dried sap will form a seal over the cut stump in four to six hours if the water drops below the base of the tree, preventing the tree from absorbing water later when the tree stand is refilled. If a seal does form, another fresh cut will need to be made. Keep your tree away from heat and draft sources like fireplaces, radiators and television sets. Research at Washington State University has found that plain old tap water is the best medium for keeping your Christmas tree as fresh as possible. For this years Christmas theme I wanted to bring the outside in. To create a warm and cozy atmosphere and transport us to a hidden holiday paradise. One of the first things I decided on was the color palette, lots of neutrals, white, silver and browns, with pops of red. The second thing I kept in mind was to keep it simple and using what you have. Extra branches of the tree cut are the trimming of the shadow boxes. White candles and neutral wrapping paper adorn the walls. I keep a running theme, burlap fabrics throughout the house tie each section together without using the same pieces over again. I want the room to look cohesive not the same. The third thing that creates a gorgeous holiday theme is keeping it personal. 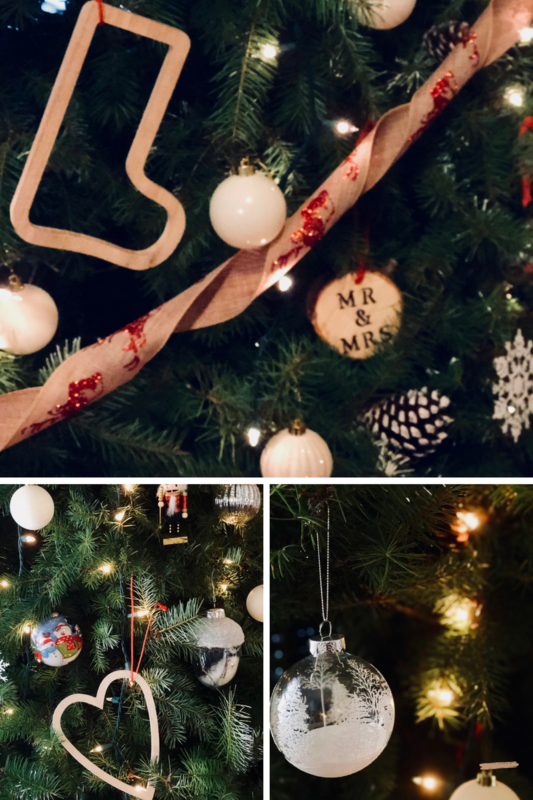 We have special ornaments are that sprinkled throughout the tree that have sentimental meaning, whether its ornaments from childhood or handmade to express a moment in life like our wedding or our first Christmas together. Adding in personal elements not only creates a sense of warmth for you but also your guests. Your Christmas theme should say as much about you and your personality as your clothing would. Besides shopping for my Christmas ornaments and tree decorations at Amara I also hit up the craft store for all the little things to complete the theme, from wrapping paper, ribbon, and pinecones. This Hideaway holiday theme is popular Scandi and Nordic interior design. Those influences come together to create a botanical edge. With the use of natural fabrics and materials while incorporating warm tones, even dusty blue, and forest green hues, bring in flashes of white and silver for a seasonal finish. Festive decorations and a well-executed theme ensure everyone will share in holiday fun while feeling warm and welcoming. Some maybe even a little jealous of your inspired holiday spectacular. Creating an impressive seasonal dining table centerpiece or mantelpiece display will take no time at all and won't leave your pocketbook empty using the advice above. If you love this rustic chic Christmas theme as much as I do here are the links to create your own rustic hideaway holiday theme. Enjoy this holiday season and remember what's truly important about this time a year. It's not about the perfect tablescape to impress your mother-in-law or buying a ton of gifts, it's about taking time out to spend time together creating lasting memories and being grateful for everything you have. Happy Holidays! !